18 Point Check-Ups are conducted on currently functioning units as part of your annual maintenance program. 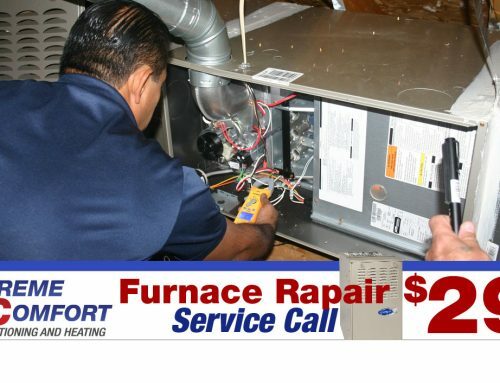 If your air conditioning unit or furnace isn’t working properly, you are in need of a Service Call, not a Check-Up. 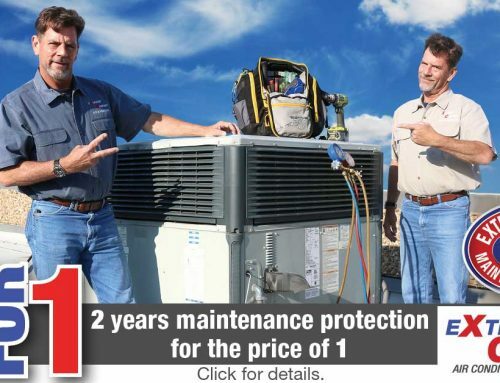 Click here for our current Service Call specials. Check-Ups must be conducted when temperatures are near or above 70 without rain for our gauges to take accurate readings. Most Air Conditioning problems can be detected in advance with a simple check up, before the sun starts to melt all of us here in DFW. Did you know that your cooling system can lose 5% of its efficiency every year it misses a tune-up? For a limited time only, take advantage of our 18 point cooling system check-up special. 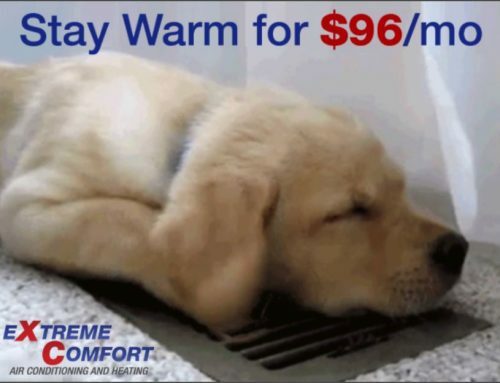 One of our Extreme Comfort Air Conditioning and Heating Technicians will check all of your air conditioner critical system component measurements, inspect accessible components for wear or potential issues, and measure air conditioner refrigerant levels for optimum performance. In addition, your technician will check overall system air flow and operation and tighten, adjust, lubricate, & calibrate components as necessary. 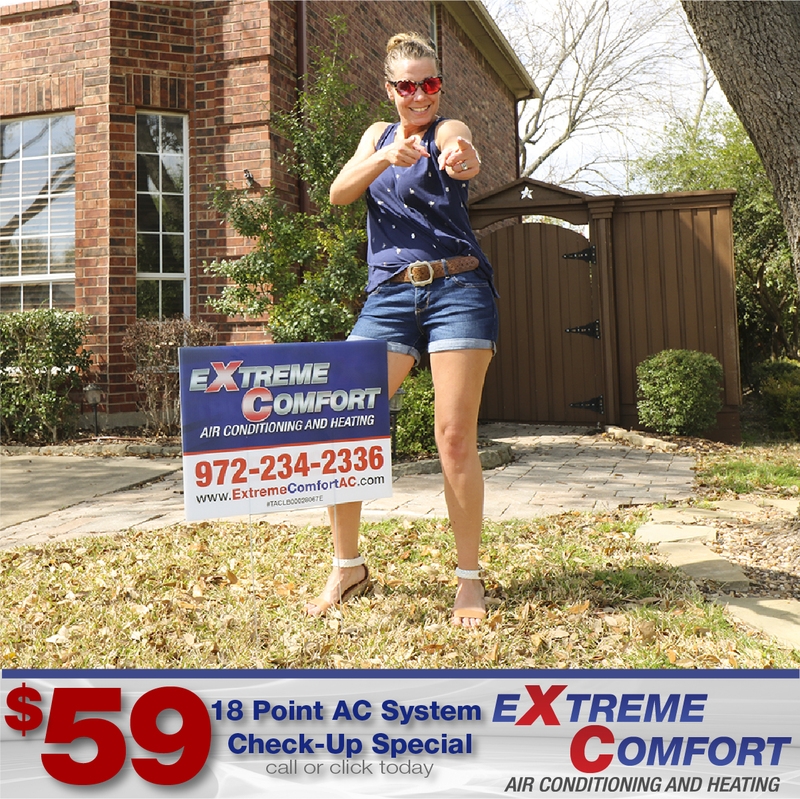 If any issues are detected, your Extreme Comfort technician will provide you with a suggested plan of action plus we will add up to one pound of R-410a refrigerant FREE if needed. Necessary parts and repair services additional. Expires 4/30/2019. Thermostat – Check temperature display accuracy and tighten lose wires that can cause short cycling. System Performance / Split Temp – Measure temperature differential across evaporator coil. Split should be 18-20°. Air Ducts – Check for air leaks. A cool attic during warm months is typically a sign of duct leakage. Electrical Box – Tighten connections and check for metal fatigue and electrical overheating (bluish-green discoloration). Condensate Drain – Check drain for debris blockage and look for key signs of drain overflow (rust or stains). Air Distribution – Check airflow and inspect areas where homeowners are experiencing a lack of comfort. Plenum – Check the duct transitions for leakage caused by system vibration or poor installation materials. Evaporator Coil – Check for bacteria build-up, formicary corrosion, galvanic corrosion, and leaking refrigerant oil. Dirty coils reduce efficiency and decrease air quality. Run Capacitors – Test all capacitors for proper microfarad “µf” capacity (max permitted ± 10%) and inspect for signs of leakage or bulging. Refrigerant – Confirm and record refrigerant pressures if system fails system performance testing or any of the visual coil inspections. Add up to 1lb of R-410a refrigerant if necessary. Condenser Coil – Examine coil for straightness and cleanliness, and leaking refrigerant oil. Take and evaluate outside split temp. Compressor – Test amp draw and compare it to max on data plate. Tighten loose wires at contactor. Safety Controls – Check all panel switches and pressure controls to make sure they are functioning properly. Condenser Motor – Check the amp draw and compare it to the max rating. Check bearings and lubricate motor as necessary. Blower Motor – Same check as condenser motor along with blower wheel inspection and bacteria build-up. Insulation – Confirm all internal unit insulation is secure. Check suction line insulation. Contactor – Look for worn or pitted points and check for discoloration or severely burnt wires.